The ultimate Revision Guide for GCSE and A Level exams. PUMP: Plan, Understand, Memorise, Practise. Written with GCSE and A-Level students in mind, Raise Your Grade will enable all students in all subjects, at all levels of study, to revise smarter and get the grades they want. 25 of the UK’s most successful revisers: A-grade achievers, who had just taken a place at Oxford University. Decide what you’ll revise and when. Get your Revision Resources together. Failing to prepare is preparing to fail. Cliché? Yep. True? Yep. No matter how much time you have left between now and your exams, time spent planning is always time wisely spent. Whether you’ve a couple of days or a couple of months, planning lets you squeeze every last drop out of your available time. Planning is for sizing up the lake of revision you’re about to fall/belly flop/dive elegantly into. Strengthen your Understanding and capture it in comprehensive Revision Notes. Right, you’ve got it all planned out. 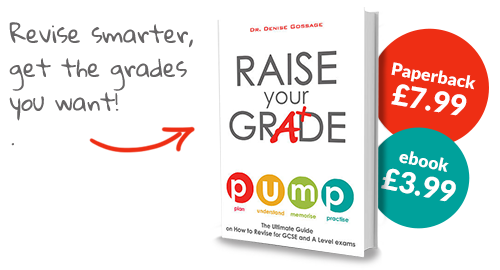 It’s time to move on to the second crucial stage of the PUMP approach: Understand. You need to make sure you get the big ideas in each topic and create your first set of revision notes. Some students make a BIG mistake here and jump straight to memorising stuff. You’ll see the skeletons of their shattered hopes and dreams scattered around the exam hall. Condense notes into Summaries to make key information stick. Review + Recall = Remember. For most subjects, Understanding is only half the battle. Only a combination of Understanding and Memorising will bring you exam success. Welcome to Phase 3! In this phase you commit to memory all the important facts and concepts in your Revision Notes through a learnable combination of the right techniques, timing and frequency. The trick is simply knowing how to use your memory effectively. Apply what you know to exam-style questions. Solidify your knowledge and master your skills. This is where it all comes together. Here’s where you apply what you know to exam-style questions. And by applying what you know, you realize what you still don’t know. The Practise phase also gives you chance to nail your exam technique. To maximise your marks, you need to learn how to demonstrate your knowledge, understanding and skills under exam conditions: nerve-wracking, gut-wrenching exam conditions. "At last. A revision tool that suits all levels of learning"
Know someone who’d like this? Why not share it with them?